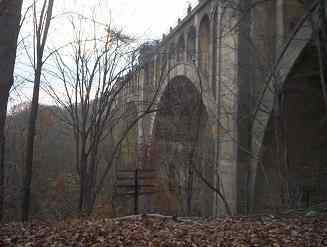 The Paulinskill Viaduct, also known as the Hainesburg Viaduct, is a railroad bridge which crosses the Paulins Kill in Knowlton Township, New Jersey. The viaduct is still in existence, although the tracks were removed in 1984. 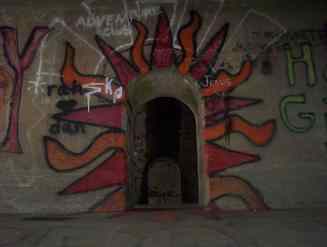 Built by the Delaware, Lackawanna and Western Railroad and completed in 1910, it was the largest reinforced concrete structure in the world and served the Lackawanna Cutoff, which was opened on Christmas Eve, 1911. 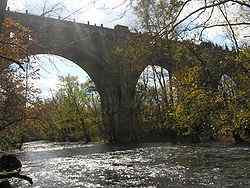 It was surpassed in size by another Lackawanna Railroad bridge, the Tunkhannock Viaduct, in 1915. 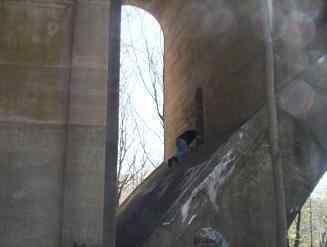 Amongst non-railfans, the Paulinskill Viaduct is known for its internal chambers (used to inspect the structural integrity of the bridge), which are popular among those who enjoy urban exploration. 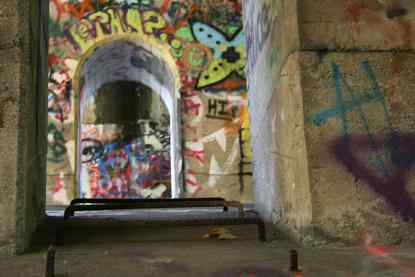 Within the past few years, the State of New Jersey has installed fencing and "No Trespassing" signs around the viaduct. New Jersey Transit is in the planning stages for restoration of Scranton/Hoboken commuter service along the Cut-Off. The Delaware River Viaduct, a sister bridge of similar design but smaller dimension (further west on the Lackawanna Cut-Off) can be observed crossing over Interstate 80 on the New Jersey side of the river just south of the Delaware Water Gap at the New Jersey/Pennsylvania border.